Before you start grooming your cat, make sure you have the right tools. Create a cat grooming toolbox where you keep everything to make grooming even easier. Nail trimmers – Look for one specifically designed for cats that is sharp, stainless steel, and has a curved tip. Ask your veterinarian for recommendations as well as a training on how to use them. Grooming comb – Combs with long, even, fine to medium teeth, rounded tips, and a handle are recommended. The handle makes it easier to reach between the forelegs and work on any mats that need to be split and worked out. 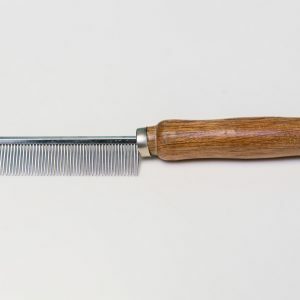 Flea comb – A comb with very fine teeth for early detection of flea infestation is helpful, especially if your cat goes outdoors or there are other pets in the household. An inexpensive plastic comb is fine, but a good quality steel comb is better. Brushes, matt splitters, rubber massage tools, and other imaginative items are all fine if they work well for you and your cat. Store your grooming tools in the same cabinet as your cat’s food to help create a positive connection. Give a food treat after a formal grooming session to help encourage a positive connection or feeling with grooming. You may also want to keep some tools near a place where your cat likes to sit on your lap for informal sessions. You may need to figure out which tools your cat prefers. If your cat isn’t a huge fan of being groomed, start with small sessions and give lots of breaks in between.